蓝天一, 牛东红, 刘晓军, 彭茂潇, 李家乐. 缢蛏C型凝集素基因ScCTL-2的序列分析及凝菌活性[J]. 上海海洋大学学报, 2019, 28(1): 20-28. LAN Tianyi, NIU Donghong, LIU Xiaojun, PENG Maoxiao, LI Jiale. Sequence analysis and bacterial agglutination of C-type lectin gene ScCTL-2 in Sinonovacula constricta[J]. Journal of Shanghai Ocean University, 2019, 28(1): 20-28. TAYLOR M E. Carbohydrate-recognition proteins of macro-phages and related cells[M]//HORTON M A. Macrophages and Related Cells. Boston: Springer, 1993. IKEDA K, SANNOH T, KAWASAKI N, et al. Serum lectin with known structure activates complement through the classical pathway[J]. The Journal of Biological Chemistry, 1987, 262(16): 7451-7454. LI H, ZHANG H, JIANG S, et al. A single-CRD C-type lectin from oyster Crassostrea gigas mediates immune recognition and pathogen elimination with a potential role in the activation of complement system[J]. Fish & Shellfish Immunology, 2015, 44(2): 566-575. MINAMIKAWA M, HINE M, RUSSELL S, et al. Isolation and partial characterization of a calcium-dependent lectin (chiletin) from the haemolymph of the flat oyster, Ostrea chilensis[J]. Fish & Shellfish Immunology, 2004, 17(5): 463-476. PENG M X, NIU D H, WANG F, et al. Complement C3 gene:expression characterization and innate immune response in razor clam Sinonovacula constricta[J]. Fish & Shellfish Immunology, 2016, 55: 223-232. NIU D H, JIN K, WANG L, et al. 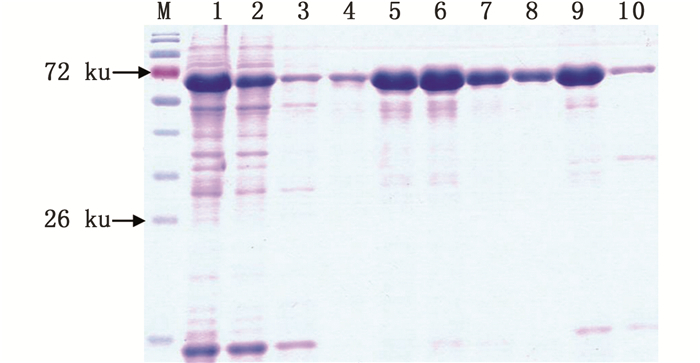 Molecular cha-racterization and expression analysis of four cathepsin L genes in the razor clam, Sinonovacula constricta[J]. Fish & Shellfish Immunology, 2013, 35(2): 581-588. GROSS P S, BARTLETT T C, BROWDY C L, et al. Immune gene discovery by expressed sequence tag analysis of hemocytes and hepatopancreas in the Pacific White Shrimp, Litopenaeus vannamei, and the Atlantic White Shrimp, L. setiferus[J]. Developmental & Comparative Immunology, 2001, 25(7): 565-577. WOOTTON E C, DYRYNDA E A, RATCLIFFE N A. Bivalve immunity:comparisons between the marine mussel (Mytilus edulis), the edible cockle (Cerastoderma edule) and the razor-shell (Ensis siliqua)[J]. Fish & Shellfish Immunology, 2003, 15(3): 195-210. ZHENG P L, WANG H, ZHAO J M, et al. 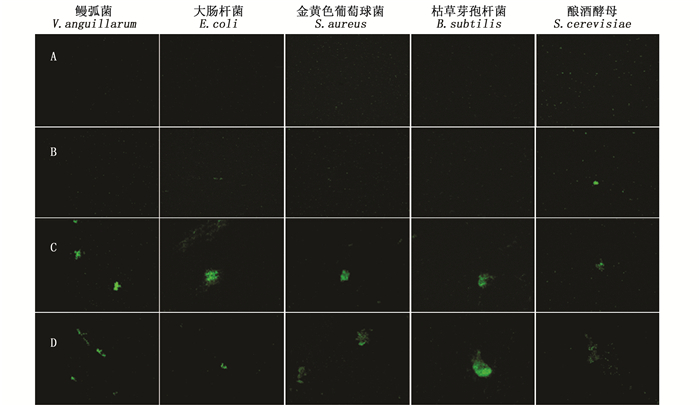 A lectin (CfLec-2) aggregating Staphylococcus haemolyticus from scallop Chlamys farreri[J]. Fish & Shellfish Immunology, 2008, 24(3): 286-293. ZHANG H, SONG X Y, WANG L L, et al. AiCTL-6, a novel C-type lectin from bay scallop Argopecten irradians with a long C-type lectin-like domain[J]. Fish & Shellfish Immunology, 2011, 30(1): 17-26. ZHANG H, WANG H, WANG L L, et al. A novel C-type lectin (Cflec-3) from Chlamys farreri with three carbohydrate-recognition domains[J]. Fish & Shellfish Immunology, 2009, 26(5): 707-715. Abstract: C-type lectins are a superfamily of Ca2+-dependent carbohydrate-binding proteins that play crucial roles in invertebrate immunity. 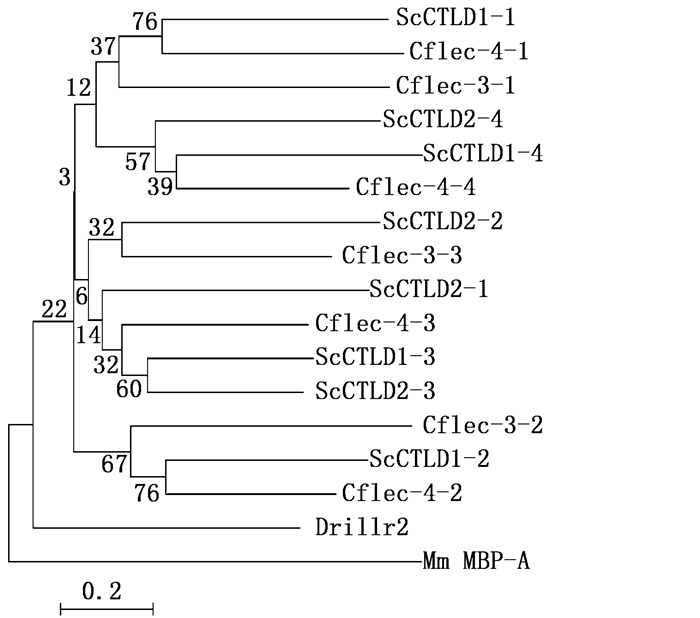 A novel C-type lectin gene (ScCTL-2) was identified in razor clam Sinonovacula constricta. Sequence analysis showed that the full length ScCTL-2 contains a 1893 bp ORF encoding 630 amino acid polypeptide with four CTLD (C-type lectin domain) and a N-terminal transmembrane region. The special structure of ScCTL-2 protein revealed that ScCTL-2 is perhaps a new group of invertebrate C-type lectins. 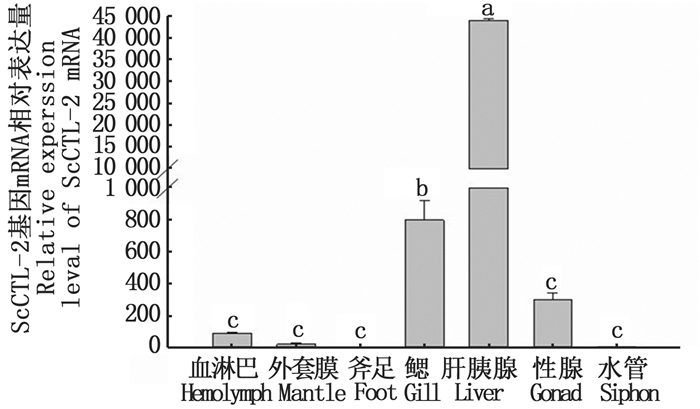 The ScCTL-2 was expressed in almost all tissues, with highest expression in hepatopancreas and the second highest expression in gill. Bacterial stimulation up-regulated ScCTL-2 expression in hemocytes. The spatial-and temporal-specific expression patterns of ScCTL-2 suggest it may be an immune-related gene in razor clam. Recombinant protein (rScCTL-2) displayed a broad bacterial agglutination spectrum, and the agglutinate activity was strictly Ca2+-dependent. It could agglutinate all the experimental bacteria only if Ca2+ existed. The results suggest ScCTL-2 is a novel gene possessing common immune characteristics of invertebrate C-type lectins.